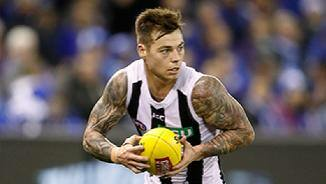 Collingwood forward Jamie Elliott ended Sunday’s VFL win on the bench after re-injuring his left hamstring. Four key senior Magpies made their return from injury and rejoined the main training group during a VFL match simulation session at the Holden Centre on Thursday night. Collingwood expects a bevy of senior players to return to full training this week. Who's stoked to see this guy back? A small forward with incredible strength and speed, Elliott marks unbelievably well for his size. His style of play has seen comparisons drawn with Paul Medhurst and Stephen Milne, but it is through his tackling and defensive work in attack that he has impressed his coaches. In his first six years, Elliott has already enjoyed some big outings, none more memorable than his five goal haul against Carlton in 2013, although many may argue his Mark of the Year against Port Adelaide was even better. Having slotted a career-high 33 goals in 2014, Elliott improved this total to 35 in 2015 and took out the Gordon Coventry Award for the club’s leading goal kicker. A nagging back injury in 2016 put the brakes on his progress, but he hit back hard last year, kicking a team-high 34 goals. A 34-goal season off the back of 17 games is more than handy in anyone’s language. When it came after a year spent sidelined due to a nasty back injury, it’s all the more meritorious. Elliott, his back finally in repaired, was primed for the season opener, only to injure his ankle during a training mishap midway through the JLT Community Series. The damage set him back several weeks before he was called upon to face St Kilda in round four, a full 588 days since his last senior appearance. From there, he went on a goal kicking spree, kicking three or more goals in six of his next seven games. Some rare misses against Brisbane aside, his accuracy in front of goal was as good as any forward in the competition, and he played his role magnificently in supporting Darcy Moore as the main targets inside Collingwood’s attacking half. Playing further afield, Elliott finished the year with a season-high 20 disposals and three goals against Melbourne in the final round. It culminated in his first Brownlow Medal votes since May 2015. A year to forget for the high-flying fan favourite. Despite showing so much promise in his first 72 games in the Black and White, a nagging back injury kept Elliott away from the field for the entirety of the 2016 campaign. After a pre-season spent away from the main group, it was announced in February that Elliott would be sidelined for a month with the ‘pars defect’ back complaint. Setbacks followed and attention turned to a 2017 return when Elliott was booked in for surgery in May. At just 24 years of age, Elliott will have plenty to offer the Magpies when he returns to the forward line in the coming season. Elliott continued to fast-track his stardom in 2015 as he once again proved one of Collingwood’s most exciting players. 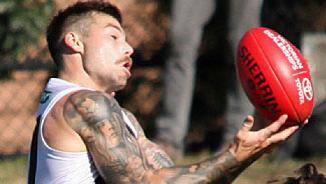 Stepping into the famous number five guernsey vacated by the departing Nick Maxwell, the Euroa native had big shoes to fill in his role in the Collingwood forward line. The flow of goals started early in the season, and failed to dry up as Elliott proved the Magpies’ most dangerous forward. He kicked four goals against St Kilda in round three, including three of Collingwood’s four goals in an explosive individual display in the third quarter. The impressive display was replicated a month later when Elliott hit a patch of form that saw his mentioned in mid-season All-Australian calculations. He produced thrilling back-to-back five-goal hauls with a handful of goals against both Gold Coast in round eight and North Melbourne in round nine. His game against the Kangaroos carried extra weight, with all five goals coming in Collingwood’s pulsating second-half fightback. As the Magpies turned a 39-point deficit into a 14-point lead, Elliott displayed composure and maturity beyond his years. His performance was rewarded with two votes from the umpires on Brownlow Medal night, taking his career total to 12 votes. After spending two weeks on the sidelines with a back injury in July, Elliott returned in the substitutes vest in round 18 against Melbourne. From this point onwards, he would hit the scoreboard in every remaining game of the season. In a forward-line devoid of the injured Travis Cloke, Elliott kicked his 35th goal of the season in round 23 to surpass Cloke as Collingwood’s leading goalkicker. While it was the first time in five years Cloke has been dethroned as the Gordon Coventry Award winner, Elliott is likely to be commanding the Magpies forward line for years to come. After signing a deal in May which will tie him to the club until the end of 2018, Elliott now has the security and confidence to further emerge into one of the premier small forwards in the AFL. Elliott’s career trajectory continues to track upwards following another terrific year inside Collingwood’s forward fifty. His best football was eye-catching, a fact underlined in round three when he kicked five straight goals and took one of the Marks of the Year over Geelong’s Jimmy Bartel. 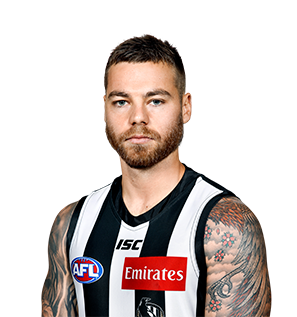 The life of a small forward has its trials, namely the propensity to drift in and out of games, but it’s a fate that rarely befalls Elliott whose work rate and hunger for the contest makes him one of Collingwood’s most reliable players. His 33 goals ranked him behind only Travis Cloke as Collingwood’s leading goal kicker, and to kick just 11 behinds illustrates just how assured he is around the big sticks. Elliott recorded at least one scoring shot in each of his 17 games and went goalless on only two occasions. As well as his five-goal haul against the Cats, he made his mark with two four-goal games in the space of three weeks against St Kilda and the Western Bulldogs and he slotted three on two other occasions. Two hamstring injuries ate into his season as the campaign drew to a close, and he was sorely missed as the Magpies fought grimly to work their way into the final eight in the last three rounds. A super season that transformed the Euroa youngster from a bit player into an integral cog in the Collingwood engine. His year started with an attempted screamer against Essendon in the NAB Cup before it all came together in front of 84,247 fans against Carlton in round two. The day started with the focus on the two senior coaches but finished squarely on the man in the No. 19 jumper. Elliott received three Brownlow votes for his five goals and 20 possessions, including two that sunk the old enemy in the tense final quarter. He had to cope with some extra attention from then on but he handled it well, bagging three against Hawthorn the following week and another three against Geelong in round eight. After a mild dip in form mid-season, Elliott finished off the year well, kicking three in successive weeks against Essendon and Sydney but had an interrupted lead in to the finals after sustaining a minor hamstring injury. In all, he kicked 30 goals in 20 games and went without a major on only six occasions. 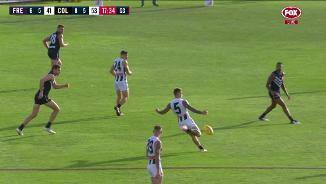 What’s more, he held two Mark of the Year contenders including the overall winner when he flew over three Port Adelaide opponents in round 14. A bright future beckons. The tough small forward showed plenty in his first year as a Magpie in 2012. Played 15 games, including a run of 12 from round nine. Had a few standout performances - kicked three goals against Gold Coast in round 10 and laid 15 tackles against Fremantle in round 14 - but tired late in the season. Won the Harry Collier Trophy as the club’s best first-year player and will benefit from a big summer on the track. Played as a top-age player for the Murray Bushrangers in the U18s. Kicked 10 goals in his five games for the Bushrangers and impressed with his forward pressure while playing for Vic Country in the U18 National Championships. Was pre-listed by Greater Western Sydney and was traded to Collingwood along with Martin Clarke and draft selection No. 67 in exchange for pick No. 25. Travelled to Arizona as part of Collingwood’s high altitude training camp late in the year. Played for the Murray Bushrangers in the TAC Cup 18s, and played two matches for Collingwood’s VFL team as a top-up player (against Box Hill and North Ballarat) in the middle of the season. Pre-listed by Greater Western Sydney ahead of the 2011 trade period. Traded by Greater Western Sydney to Collingwood in exchange for selection No. 25 (Sebastian Ross).